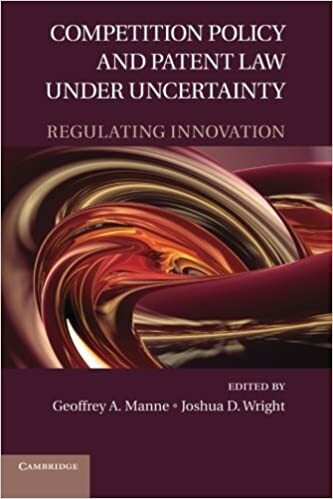 Our book, Competition Policy and Patent Law Under Uncertainty: Regulating Innovation will be published by Cambridge University Press in July. The book’s page on the CUP website is here. After a century of exponential growth in innovation, we have reached an era of serious doubts about the sustainability of the trend. Manne and Wright have put together a first-rate collection of essays addressing two of the important policy levers – competition law and patent law – that society can pull to stimulate or retard technological progress. Anyone interested in the future of innovation should read it. Here, in one volume, is a collection of papers by outstanding scholars who offer readers insightful new discussions of a wide variety of patent policy problems and puzzles. If you seek fresh, bright thoughts on these matters, this is your source. This volume is an essential compendium of the best current thinking on a range of intersecting subjects – antitrust and patent law, dynamic versus static competition analysis, incentives for innovation, and the importance of humility in the formulation of policies concerning these subjects, about which all but first principles are uncertain and disputed. The essays originate in two conferences organized by the editors, who attracted the leading scholars in their respective fields to make contributions; the result is that rara avis, a contributed volume more valuable even than the sum of its considerable parts. Competition Policy and Patent Law under Uncertainty is a splendid collection of essays edited by two top scholars of competition policy and intellectual property. The contributions come from many of the world’s leading experts in patent law, competition policy, and industrial economics. This anthology takes on a broad range of topics in a comprehensive and even-handed way, including the political economy of patents, the patent process, and patent law as a system of property rights. It also includes excellent essays on post-issuance patent practices, the types of practices that might be deemed anticompetitive, the appropriate role of antitrust law, and even network effects and some legal history. This volume is a must-read for every serious scholar of patent and antitrust law. I cannot think of another book that offers this broad and rich a view of its subject. I would have said the book was self-recommending. But I’ll take these recommendations any day.